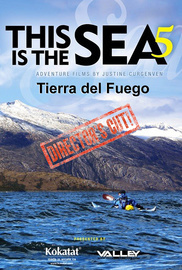 An attempt to complete a world-first kayaking trip 1000 miles around Isla Grande in Patagonia. Shipping delays, a stolen kayak and storm force winds challenge the team. "Tierra Del Fuego", a film of a world-first 1000 mile paddle around the remote and windswept island of "Isla Grande" in Patagonia won "Best Seakayaking Film" in both the 2013 Reel Paddling Film Festival & the 2013 Waterwalker Film Festival & was a finalist at "Kendal Mountain Film Festival". A British couple are trying to become the first people to sea kayak 1,000 miles around the remote & windswept island of "Isla Grande" in ‘Tierra del Fuego’ at the end of the world. Shipping delays, a stolen kayak & endless red tape challenge them on land while incessant winds, rough seas & tendonitis threaten their safety & success on the water. Glaciers tumble into the sea in this wild & beautiful landscape where sea lions, whales & albatrosses far outnumber people. Share the highs and lows of this challenging world-first adventure, while meeting some of the interesting people who survive in this harsh environment.